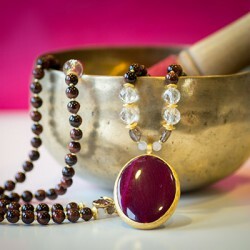 A mala necklace is a set of beads that has traditionally been used in prayer and meditation, often called prayer beads. Mala beads can be worn by anyone seeking a calmer mind, body, and spirit. Fareeva malas are handmade with beautiful gemstones. The semi-precious gemstones used in the Fareeva malas are believed to offer different healing qualities. When choosing a mala, we invite you to dive into your intuitive heart to select a mala that best embodies your personality and reflects your intentions. If requested, prayer bead malas can be made to specific spiritual numbers: 108/54. The number 108 is a significant number for many reasons. Some associate the possibility of enlightenment with taking only 108 breaths a day while in deep meditation. Others connect the number’s significance to the heart chakra, as there is said to be 108 energy lines leading to it, one of which is believed to be the path to self-realization. All beads are handpicked (throughout the world), and therefore, carry the personal and unique touch which make the Fareeva malas a rather unique experience and a journey. In the same spirit as malas, the Fareeva bracelets are created with healing semi-precious stones, handpicked throughout the world. Uniquely designed to carry the vibration of the dreamed intentions we wish to manifest. 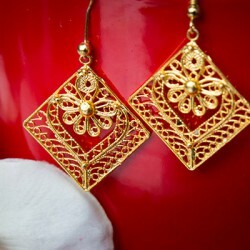 They are designed to be easily wore while keeping its magic and pure elegance. 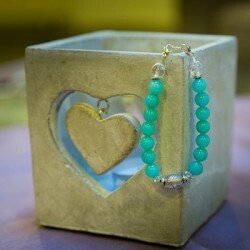 Wish to hold healing precious vibrations and gems close to your skin? Choose a set of earrings maybe? The short necklaces are intended to be wore close to the fifth chakra – Visuddhi – which calls for the expression of our deepest authentic Truth. Fareeva malas are reasonably priced, especially given the unique and personal vibration offered. They are all handmade, locally produced and unique being a one and only piece. All 108 prayer beads malas will be at a price of 108 francs or dollars to align with the healing vibration of sacred geometry and cosmic numbering offered by the gems and beads. All other items will be priced according to the value of the selected gems.